I started smoking when I was 12 years old. Smoking and Dexatrim™ became my diet of choice for many years. A dozen years ago, I had a desire to change my relationship to tobacco. I was a Sacred Pipe carrier and smoked a pack and a half of cigarettes a day. It seemed conflicted to me that I would use tobacco in prayer and ceremony, and then mindlessly abuse it throughout the day. I set a goal: July 4, 1997 would be my Day of Independence, freedom from smoking. 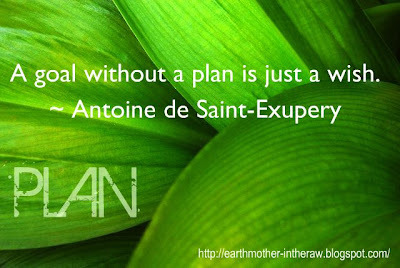 Then, I came up with a plan to work toward my goal. Success! Eleven years and counting, smoke free! Of course, I put on 100 pounds in the meantime. Transferring one addiction for another is not freedom. With the extra pounds, came a host of chronic physical symptoms – heartburn, headaches, edema, aches, pains, fatigue, depression, shortness of breath – and quite frankly, I was sick and tired of feeling sick and tired, all the time. On the last summer solstice, I set an intention to change my relationship to food and regain my health and vitality. The goal, for me, wasn't so much about the number on the scale. I wanted to find freedom from mindless, compulsive eating. I wanted to begin living a healthier lifestyle that was more in alignment with my core beliefs. And I knew that having a PLAN was the key. And so began my transition from highly refined and processed foods to a diet of primarily fresh, organic, plant-based foods. First things first: planning my meals. This actually involves forethought and grocery shopping. Imagine that. And, it means ensuring that I have plenty of fresh fruits, vegetables, sprouts, seeds and nuts on hand. I also like to stock an assortment of fruit in the freezer, cut and ready to throw into the blender for delicious green smoothies. I've learned from experience that when I'm away from home and hunger strikes, it's just too easy for me to make poor food choices. For years, my car was set to auto-pilot to the nearest drive-thru window. So now, if I know I'm going to be out running around for more than several hours, I'll plan on taking a mason jar of green smoothie with me. Little bags of organic baby carrots, crunchy sprouts, dried fruits, and nuts are great take-alongs too. Fail to Plan. Plan to Fail. Simple. And, you can quote me on that. What are some things you do to PLAN for success on your diet?